The collapse of the Grenadian Revolution on Oct. 19, 1983 should be carefully examined for the lessons that it might offer to organisers in the Caribbean who are currently organising with the labouring classes. If the working class shall be the architect of its liberation, the process of revolution-making should enable them to fulfil that role. Fundamental change should not be the outcome of a vanguard force that usurps the initiative of the people. Class difference and the way in which it divides women was an issue women in the feminist movement talked about long before race. In the mostly white circles of a newly formed women’s liberation movement the most glaring separation between women was that of class. White working-class women recognised that class hierarchies were present in the movement. Conflict arose between the reformist vision of women’s liberation which basically demanded equal rights for women within the existing class structure, and more radical and/or revolutionary models, which called for a fundamental change in the existing structure so that models of mutuality and equality could replace the old paradigms. However, as the feminist movement progressed and privileged groups of well-educated white women began to achieve equal access to class power with their male counterparts, feminist class struggle was born. 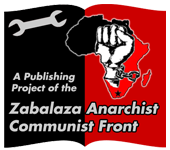 Text from the website of the North-eastern Federation of Anarchist Communists. Some supporters of gay marriage point to the economic benefits of marriage. Working class and poor queers need marriage to help alleviate their poverty; immigrant queers need marriage to get US citizenship. I agree. Yet, let’s not forget that many queers will never get married because of their suspicions of state institutions. Granting gay marriage doesn’t guarantee that immigrant spouses get visas or are free from ICE harassment. Also, around us we see families for whom marriage has not helped alleviate the race and class oppressions that they face everyday…. This piece was written by JOMO, a member of the Black Orchid Collective. One of the chief ideological disputes between the Spanish anarchists and communists during the Civil War was the anarchists’ insistence that social revolution should not be postponed until the war was won; without the social revolution (by which they meant the defeat of authoritarianism and the transformation of all social and economic relations and institutions to permit maximum individual freedom, self-expression, and spontaneity), the war would be just another changing of the guard, so familiar in Spanish history. Vol. 6, No. 2 (1971), pp. 101-110. Privilege and the theory around it is a significant topic of debate at the moment among those interested in radical social change. Touching on many issues dear to the hearts of anarchists, it is hard to avoid. Yet, the two are not fitting together as well as they should and there is a sense of unease about this. Much of this is because privilege theory has emerged from US academic circles rather than anarchist ones and, ironically, has been co-opted to protect middle- class privileges. This is a situation in need of repair if we are to maintain our links with feminist, anti- racist and other struggles against oppression. If we are to create a mass movement capable of social change then it has to be able to engage with everyone in the first place.